Footy-Boots correspondent Matt Dawson was on hand to snap some great shots of a future model of the Adidas F50 line during a Real Madrid training session. Based in Texas, Matt was training with Real Madrid’s youth team. He had the opportunity to watch the first team and managed to get us some fantastic shots of a blackout Adidas F50 prototype. Higuain was wearing the blackout football boot while training so he zoomed in and snagged a picture. A true football boot fanatic, he was even on the job in Madrid. It took him some shoving around from a balcony but we think it was well worth it! Thanks to Big Soccer, they can now be identified as the adidas F50 i TUNiT. 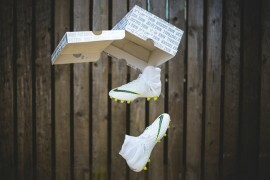 They are believed to be released near the end of 2009 and will retail at around £120 or $195. The first three colourways to be released will be Royal Blue/White/Black, Black/White/Blue, and White/Black/Red. Members of the Soccer Pulse Boot Room have had a go at what they believe the final design will appear as using Photoshop as shown below. As the norm with the TUNiT system, these football boots come with three stud systems to ensure you get the right traction for your surface. Soft Ground, Hard Ground and Firm Ground. As is usual with the F50 football boot, the i TUNiT features an innovative lace cover. This one has been redesigned to provide you with a nice smooth strike zone for the football and an optimal fit.' It appears that it has been shaped and trimmed to reduce the weight. A transparent heel is still visible, but its size appears to have been reduced. This will make these TUNiTs the third edition to feature”Alles Klar” (All Clear) element , aiding stability and reducing weight. Because of different degrees of hardness, it also results in much greater stability and flexibility. Since greater stability is required in the heel area, the material of the “Alles Klar” element is particularly strong and stable here, becoming softer and more flexible towards the forefoot. Expect to see top players from all corners of the globe sporting these kicks come next winter. Be sure to check back here at Footy-Boots as more news about the adidas F50 i TUNiT unfolds. You heard it here first! Loading... Tell us what you think of the Adidas F50 i TUNiT football boots. If u go on youtube and type F50 i u can see the first 3 colors they r comin out wit!! its a better view 2!!! 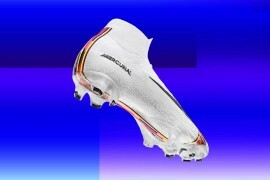 I have tried the new f50 i tunit and it’s the best boots i ever had and belive me i had many. Adidas f50 i tunit its the best football boots in the world at the moment, better than superfly too. do you have the k-leather ones i am just about to buy them but dont know how light they will be if they are in leather not synthetic. how much do they weigh?? Look to be much better than the .9’s but I don’t like 50’s. Anyone know if it’ll be offered in F30’s cuz then I might be excited. Can u use parts from the previous f50.9 on the new f50 i. For example the old chassis on the new boot or the new f50 i chassis with the old f50.9 boot. Same with the studs. Are the chassis and studs from the f50 i different from those of the f50.9s. If they are not diffrent can u use them on eachother. How do these weigh compared to the predator powerswerve? Do they weigh more or less than them. Very nice design by adidas by the way. donde puedo conseguir los chimpunes de messi varatos?